Visualization is a buzzword today, the successful result of many research systems built in the last two decades. UMass Lowell with the Open Indicators Consortium (OIC) has developed yet another open-source high performance collaborative and highly flexible web-based visual analytics framework. However this system, called Weave, is a research system that brings a number of state of the art approaches which together provide a step toward the solution of one of the grand challenges in visualization, namely visualization for the masses, as well as an attack on several others. We will describe very briefly Weave, its architecture, work with the OIC, provide some demos of OIC members’ sites and highlight its state of the art aspects, the key being its session state-based architecture. Georges Grinstein is Professor of Computer Science at the University of Massachusetts Lowell, head of its Bioinformatics and Cheminformatics Program, Co-director of its Institute for Visualization and Perception Research, and of its Center for Biomolecular and Medical Informatics. He received his Ph.D. in Mathematics from the University of Rochester in 1978. His work is broad and interdisciplinary, ranging from the perceptual foundations of visualization to techniques for very high-dimensional data visualization to visualization applications to a theory of visualization, with the emphasis on the modeling, visualization, and analysis of complex information systems. He has over 30 years in academia with extensive private consulting, over 100 research grants, products in use nationally and internationally, several patents, numerous publications in journals and conferences, a new book on interactive data visualization, founded several companies, been the organizer or chair of national and international conferences and workshops in Computer Graphics, in Visualization, and in Data Mining, and has given numerous keynotes. He has mentored over 25 doctoral students and hundreds of graduate students. 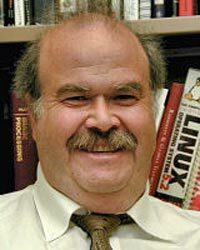 He has been on the editorial boards of several journals in Computer Graphics and Data Mining, a member of ANSI and ISO, a NATO Expert, and a technology consultant for various public agencies. For the last eight years he has co-chaired the IEEE InfoVis and VAST contests in visual analytics leading to new research areas; has taught Radical Design, a course teaching students how to innovate with "radical" new products instead of evolutionary ones; is a member of the Homeland Security Center CCICADA; and is co-director of the new Open Indicators Consortium that is continuing the development of its web-based interactive collaborative visual analytics system.